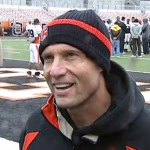 Click Here to Watch The Video: “Mike Riley Interview, Oregon State Beavers” OSU spring training for Beavers football is in it’s second week. Coach Riley braves the rain to field questions about the Beavers and the coming season. Not to mention a pro-athlete alumnus or two who came down to hang out with the team. 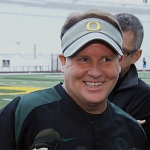 Chip Kelly Interview: How’s Duck Football Shaping Up?